Upright and bushy with soft green leaves that are serrated and aromatic. Height 75cm and spread 60cm. Will need a light trim after winter. Ideal for hedges, lining walkways and mass planting. Plant 1½m apart for a hedge. Replace every 3-4 years. Add flower buds sparingly to salads for added colour and taste. Instead of Rosemary, add a few twigs off lavender when preparing chicken. Flowers can be crystallized to decorate dessert and confectionery. Will treat nervous exhaustion, tension headaches, during labour, colic and indigestion. A weak infusion ( 25% of normal strength) can be given to babies for colic, irritability and excitement. It will help you sleep. 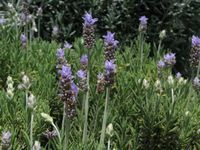 Burn lavender stalks/flowers to disinfect/deodorize/perfume the room - it has a calming and soothing effect. It is a good mosquito, midge, and fly repellent. 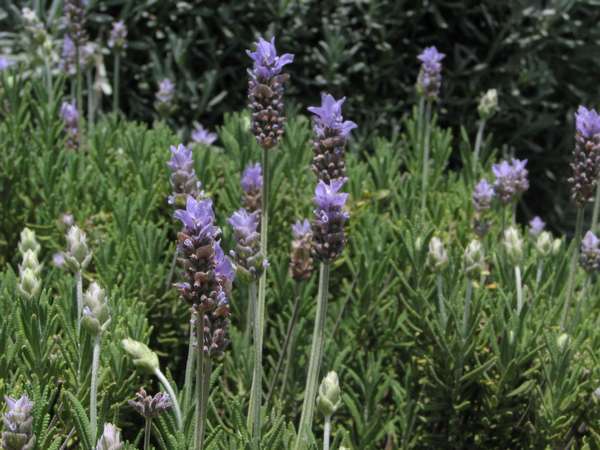 Rub lavender onto kitchen counters to discourage flies. Sprinkle a few drops of oil on bed linen to repel mosquitoes. Place sachets of dried flowers and leaves with clothes to deter moths.